Being in a technology field for so long I don’t really like business cards. So much so that I refused to have one for a very long time. However, once you start talking to more people than those 6 cubicles of separation – you might need some of those so that people will remember you when they throw them out of their wallets. Friday I have returned from a summit hosted by one of the largest ERP vendors. I’ve met a lot of people. I’ve sat through a lot of demos. My wallet got fat from all the business cards I was handed (and I ran out of mine in under 30 seconds). My first impulse was to throw this thick stack of dead tree remains into garbage, but I have realized I might need to get in touch with some of these people. However, there is no way I will have enough time to input contacts from all these cards into my phone manually. So I ventured on a quest for mobile app that will allow me to scan these cards into my contacts. My needs are simple – it has to be free app so I could try it before purchasing “Pro Elite SpetsNaz Ninja” version, it has to scan the card, convert it into contact information and store it in my address book. I don’t need any kind of cloud sync since my contacts are already syncing perfectly fine thanks to Google accounts. In fact – I don’t need to store MY contacts anywhere else aside from my own address book. On top of that – I don’t think I even need to store an image of the card. Once I got all the juice out of it the image can be discarded. It doesn’t get any simpler than that, right? I had a chance to run through six apps for Android since I am using HTC Thunderbolt. I deliberately skipped paid only apps because I don’t feel like paying for something I can’t try and I don’t want to bother with requesting refunds, disputing charges and so on. If you don’t have a way for me to try your app – it doesn’t exist (unless I already know what it does and how it does it from another source). Disclaimer – none of the developers had anything to do with me reviewing their apps. I did this on my own time and when I saw my own need for the app like this. In order to create this ad-hoc review I have selected 5 business cards (2 of them are mine, three were handed over to me at the summit). In most cases I discarded the worst result and compared the performance on the rest. I considered the card scanned properly if it picked up person’s name, phone and e-mail (these are must), company name and company URL are nice to haves, everything else is optional. Two of the cards are aligned vertically and in addition to company logo contain text only. Other cards were: text only, average boring corporate business card where company name is a fancily obfuscated Times New Roman text and a business card with plenty of text that looks like cheap flyer (my old business card, in case you wonder). All testing was done in a regularly lit office space. Here’s the outcome, sorted by performance. This is the most impressive failure of the app. Not only it failed to properly extract information from any card I fed it, the information extracted was a pile of garbage – nothing that was even remotely recoverable. However, it was really fast at failing and had only the permissions necessary for an app like this – read/write contact data, modify/delete storage contents. I’m sure it might have worked better for someone else, otherwise it’s hard to explain those 25 positive reviews. The full version of the app costs $1.99 and has only 2 reviews. I guess that tells enough to make a decision. This app simply does not stand out. Average speed, some issues with scanning simple cards and font confusion – it scanned more complex card, but failed at simple card that used Terminal font. Allows image import, which is convenient if you have a pile of cards and don’t feel like scanning them one by one – might as well snap a picture of a card on the go and scan when you get around to it. This app also has proper permissions (read/write contact data, modify/delete storage contents). In addition to poor performance the app sports somewhat confusing interface – all visible buttons for calling/emailing/texting to the contact instead of actually managing the contact. The full $3.99 version of this app has only one review with the score of 1 in app store. Not good. Yep, that’s the name for the app. I guess other 5 names were taken already. It scanned and recognized information here and there, but failed to provide consistent results. Simply ignored all my attempts at scanning vertically aligned cards by cropping the top part of it and refusing to change its behavior. There is also an issue with app’s permissions – it wants to read from the system’s various log files. Why would it need to do that is beyond me. Not a keeper, even though it is priced at $4.99 for full version. I really want to like this app. Even though it’s a slow, two step process – take a picture, wait, review the image, scan, wait a little more, review the information, save it. Even though it made out only two out of 4 cards. The reason for me wanting to like it is its interactive, user friendly way to get the card scanned properly. The app gets out of its way to really please and asks a bunch of questions about whether it got the information right, is the image positioned properly and whether or not the company name is really that weird word with “, Inc.” at the end. Permission-wise it’s the same as most other contenders: directly call phone numbers, send SMS messages. Why every app wants me to use it to make phone calls I have no idea. But I appreciate the fact that developers of this app have realized the imperfection of their OCR system and provided an interactive and user-friendly way to assist the user in fixing recognition errors. I am keeping it for more testing. There is a limit on a Lite version: “This version only saves two cards per week to the address book”, but for what effectively is a useless trial version of the $6.99 app it’s fine. This app doesn’t quite stand out, except for weird permission to let the app change the Wi-Fi state. 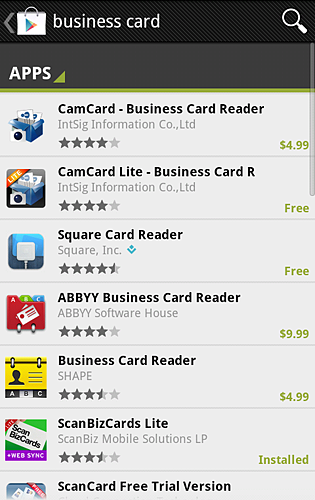 What does business card scanning app have to do with Wi-Fi? Moderate speed, but less than decent interface – fields are represented by tiny blurry icons. Given that app recognizes different text as different fields it’s hard to guess, initially, what each icon means. During my first run I got 2 out of 5 cards recognized, but after fiddling with settings I figured that the default language is set to Chinese. When I switched to English I got a better score of 3 out of 4, however it still failed at some fairly simple lines on a couple of cards. The full version of the app costs $5.99 and comes with support on Beijing time. Before you even able to use this app there are two things that hit you right in your face. First is a set of permissions this app requires: coarse (network-based) location and fine (GPS) location, directly call phone numbers and change Wi-Fi state. I can imagine it yet another app that wants me to make phone calls directly from it, but what the heck does it need my GPS location for? Second – it requires a registration to use it. Not just some “come up with a stupid user name” registration – it actually asks you for an e-mail, sends you a confirmation link and only when you click it – you are allowed to use this free app. On top of that all the images of business cards you take are uploaded to “the cloud” for processing, so no actual OCR takes place on your phone. Which is, probably, why it has the highest score out of all other apps – it correctly recognized information on all cards I fed into it. It took it’s sweet time averaging just under 5 minutes for each card and, of course, requiring a constant internet connection for exchange. While it does work flawlessly, the fact that it requires so much information to run makes me uneasy, so I don’t feel like keeping a foreign watchdog on my phone. If you don’t care about privacy or other fancy stuff on your phone than the last app is definitely a winner. Otherwise – I am having a hard time choosing which app I would want to use on a daily basis. As always – take the reviews in app store with a grain of salt and use common sense when picking an app for your use.